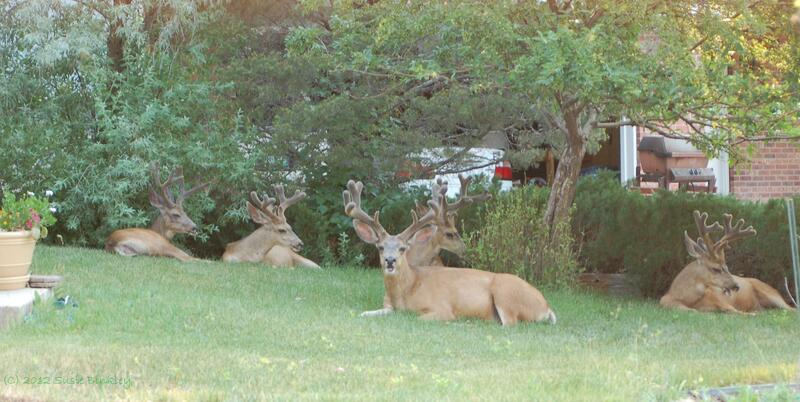 My family lives on the northwest side of Colorado Springs. 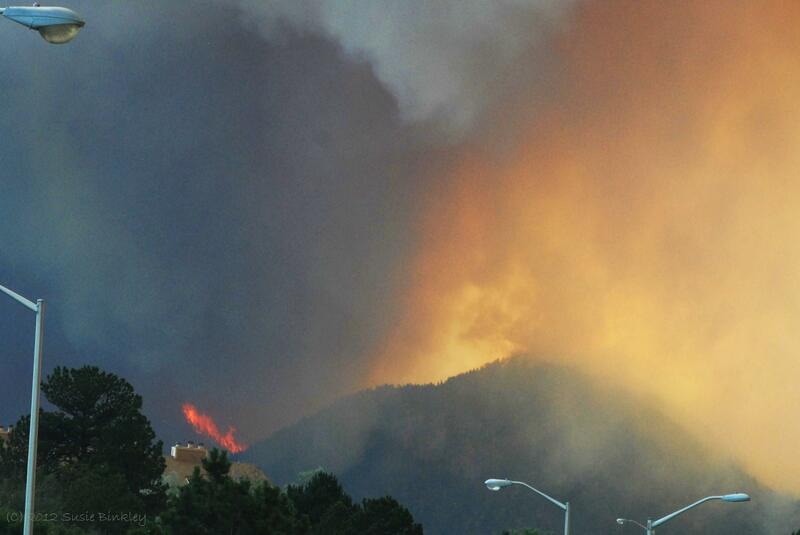 This is our emotional story of the Waldo Canyon Fire. While our outcome was far better than so many, it was nonetheless an incredibly traumatic experience. I share this as a reminder of the preciousness of life, the resilience of the human spirit, the strength of community, and the fragility of nature. Dedicated to all the first responders and the incident commanders who did such a remarkable job. My first thought when I saw the smoke was “No. Not like High Park. Not here!” The High Park fire in Ft. Collins, two hours north of us, had been raging for weeks, sending smoke to our skies and destroying hundreds of homes. My sister-in-law, Jill, had just called me. It was Saturday, June 23rd. “Susie, look outside. 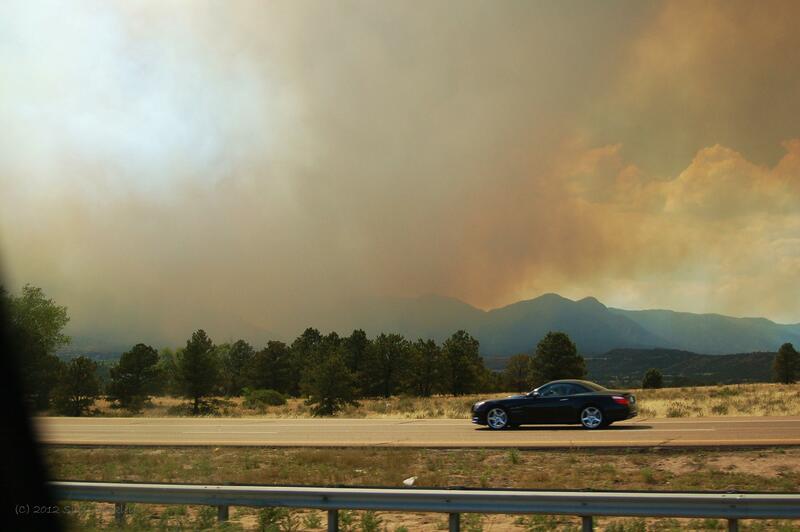 There’s a wildfire in Waldo Canyon.” She, my brother, and niece were returning from Denver around noon and could see the smoke from 25 miles away. “Jim’s been called in to help.” My brother’s been a firefighter and doing communications for the county for years. Somehow, this made my spine tingle. “Might want to keep an eye on this one!” Jill said. I did nothing else for the next ten days. 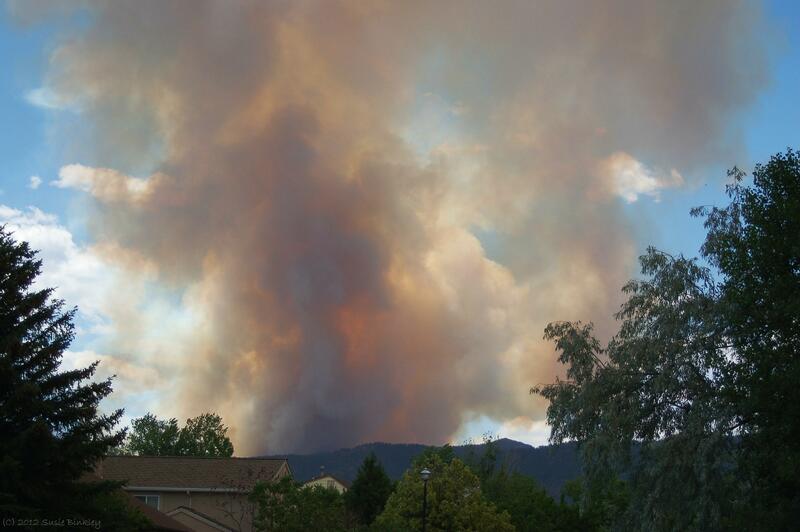 A couple of hours later my daughter’s best friend texted from her house in Mountain Shadows: “We’re under a pre-evacuation notice”. I scoured online maps to see just how close Waldo Canyon was to their house. That rugged terrain can be tough to get a good perspective on, and I was disoriented. 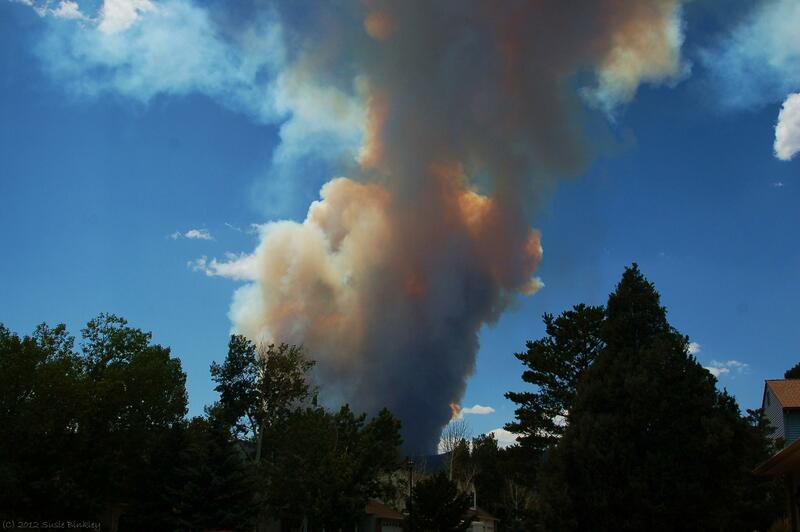 I was shocked to see how close the fire was to them, and also to our town’s beloved natural landmark, Garden of the Gods. I began to worry about both. The tingle in my spine became a lump in my throat, as the smoke spread. I was starting to smell it in the air and sent my asthmatic son inside. That day was a tense one. My brother went off to help as he could, yet we had no news from him till late in the night. He knew nothing we hadn’t seen on the news. We were left wondering, unable to think about anything else. How bad would this get? Would it be like High Park? Draining, emotionally exhausting thoughts began filling our heads. The next day was supposed to be a lazy grocery shopping and hanging out at home day, but that would never be. Instead, it was surreal, spent sorting through the house, finding pictures and important papers, wondering what we would pack if we, too, were evacuated. 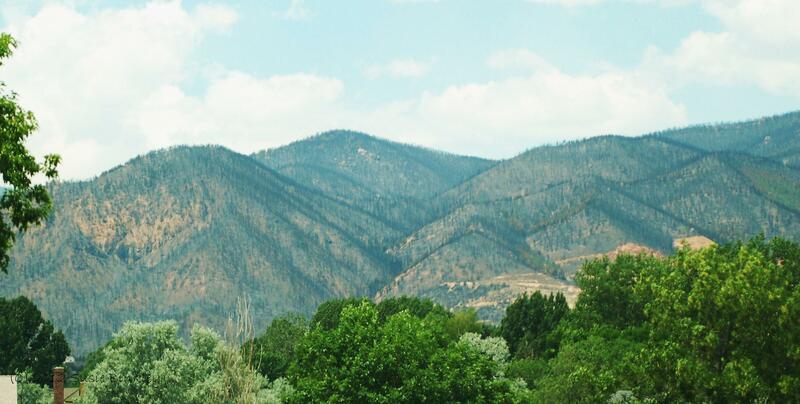 The mountains where the fire was spreading loomed heavily to the west. 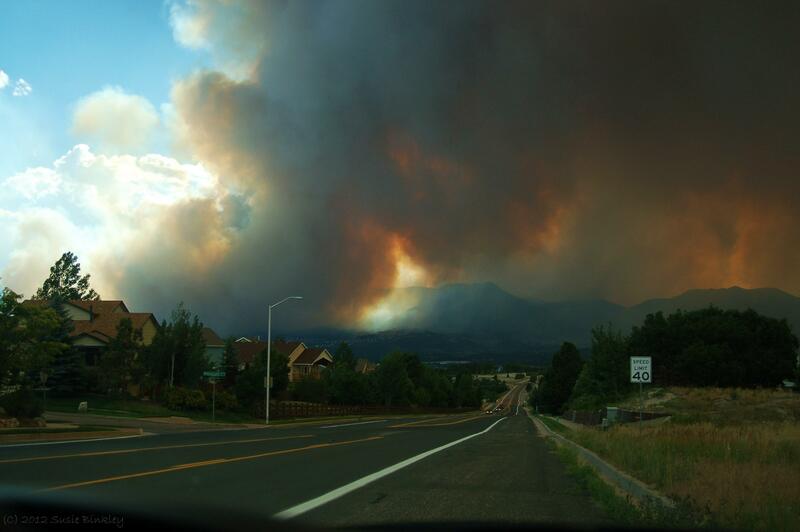 This had always been the fear- a fire in the Pike National Forest that our city nestles against. They say opposites attract and for me and my husband, it sure is true when it comes to how we view the future. He’s normally the eternal optimist, a card-carrying member of both the “nothing’s gonna happen!” and “what are the chances?” clubs. Me? I can usually sense or foresee danger five miles away and two months out. He calls it pessimistic. I call it careful. At that moment I knew this must be as big and as scary as I thought. We spent the day packing, sorting, listing, prioritizing. But then weariness set in, the TV’s lure got a hold of us, and we just sat and watched it, awestruck. I had one errand to run that evening, so the kids and I headed briefly out. 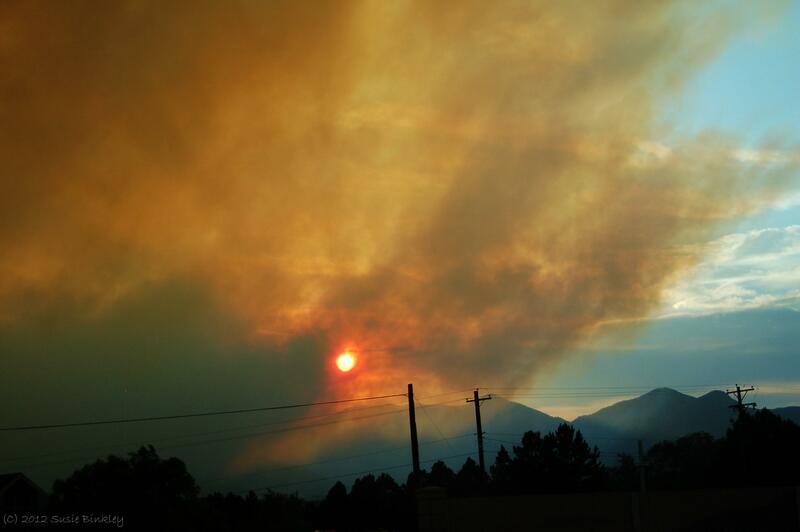 We stopped at Ute Valley Park, between us and the fire/evacuated area, and watched the sun set as the smoke tinged the sky and crept menacingly along the Rampart Range just to our west. I was nauseated. 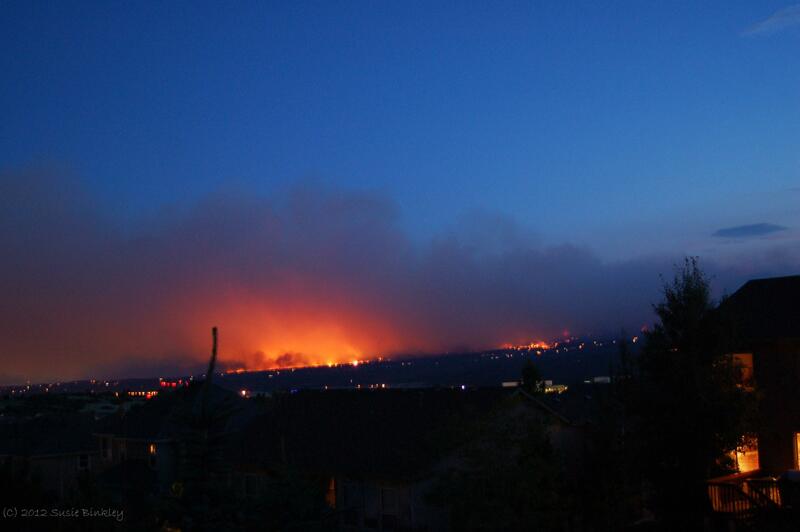 When you live in Colorado, in the “wildland-urban interface” as they call it, you know these things can happen. 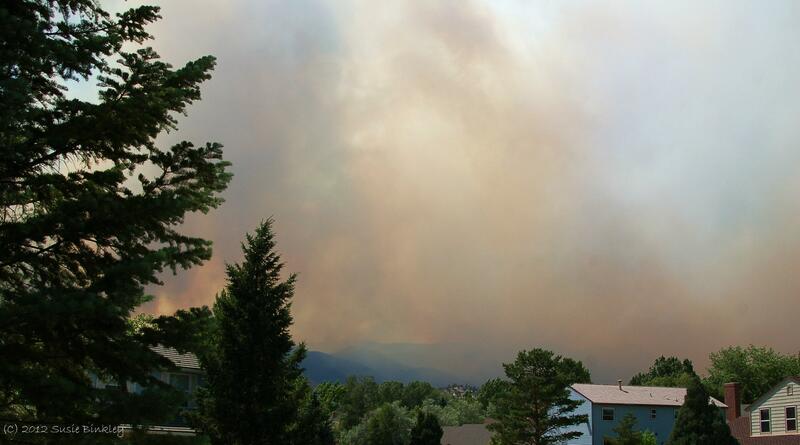 You know it and you know it, and you prepare as best you can, trimming trees, using rock instead of mulch, and our fire department trains and trains, but nothing prepared us for seeing smoke in the mountains next to our community. Nothing prepared us for how frightening that scene would be. Colorado is a mountainous bounty of natural beauty. The vast coniferous forests, the stunning rock formations, the abundant wildlife all draw us here to live among nature’s wonders. We cherish our natural landscapes, our fabulous views, our miles and miles of hiking trails, and for us in Colorado Springs, our very city cradled up against the foothills of “America’s Mountain”, Pikes Peak. “America the Beautiful” was written about this landscape. If you’ve ever visited, you know why. To see it smoldering was… wrenching. Monday came and brought with it some normalcy as my husband went off to work, and some welcomed excitement as my teenage daughter started an internship at Challenger Center (think “Space Camp”!). Focusing on her happiness was a fantastic distraction for me and her younger brother. We stayed home and made cookies that day while the TV droned in the background, flashing updates, holding press conferences, showing all that smoke that now filled our noses. And of course, as all this went on, I kept running outside to take pictures, wanting to document this awful experience. From up at Challenger Center when we picked my daughter up on Monday afternoon, I could see that the fire was contained well beyond the closest ridges of the Front Range, and that made me feel a little better. 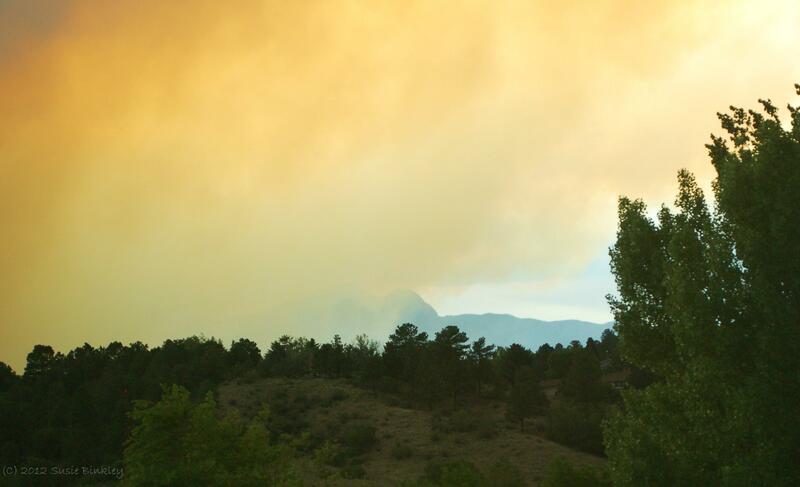 From down at our house, I couldn’t see up above the ridge line, and the smoke often looked deceptively close. That evening we spent a lot of time out in the street & wandering the cul-de-sacs with our neighbors. From our house the gorgeous Rampart Range (the southern end of Colorado’s “Front Range”) takes center stage in our view, but the ridges of Ute Valley Park block our view of where the fire was burning. 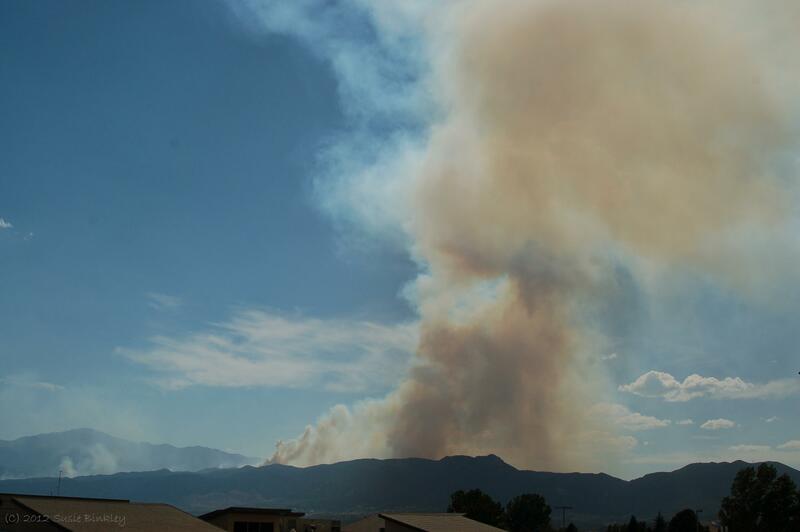 That meant that so long as we couldn’t see the flames, we knew the fire was contained over the ridge of the Front Range. We gawked and held our breath with our neighbors until well after midnight. Then we went to bed but barely slept, wondering, wondering what tomorrow would hold. Tuesday began just as Monday had. Off to work for my husband, and off to the exciting internship for my daughter. The fire had calmed down a bit, at least smoke-wise, overnight. I tried to breathe and relax, but somehow just couldn’t. 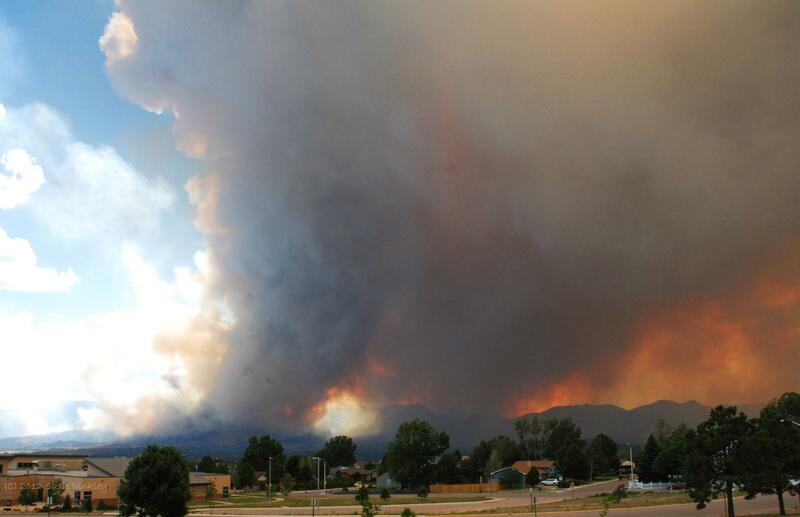 I was worried: for my evacuated friends, for my town, for the beautiful nature that draws all of us here in Colorado to come and call this semi-wild place home. Challenger Center is across the highway and up north from our house, so my son and I had a panoramic view of the Front Range as we drove home from dropping his sister off in the morning. An eerie stillness hung over the city. It seemed that half-a-million people were holding their collective breath. Then we spotted them! 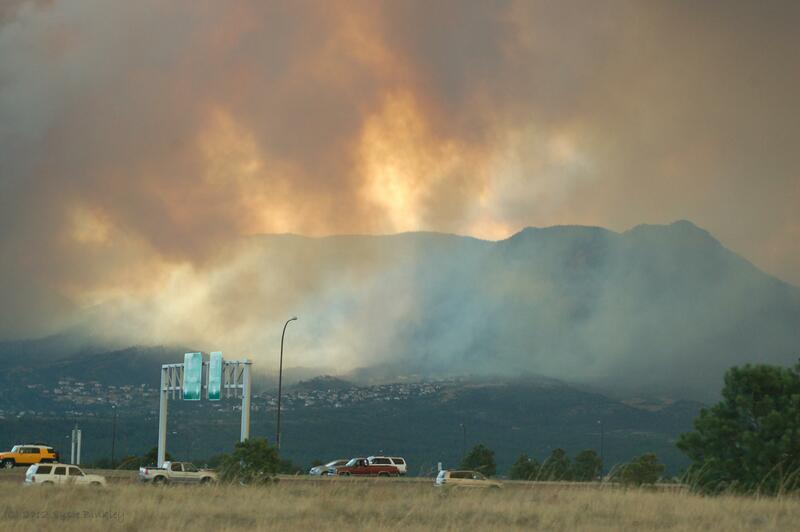 The C-130’s were finally flying, laying down reddish stripes of fire retardant, zipping to and fro, and there were water-carrying helicopters taking off and landing at the Air Force Academy as we drove by. 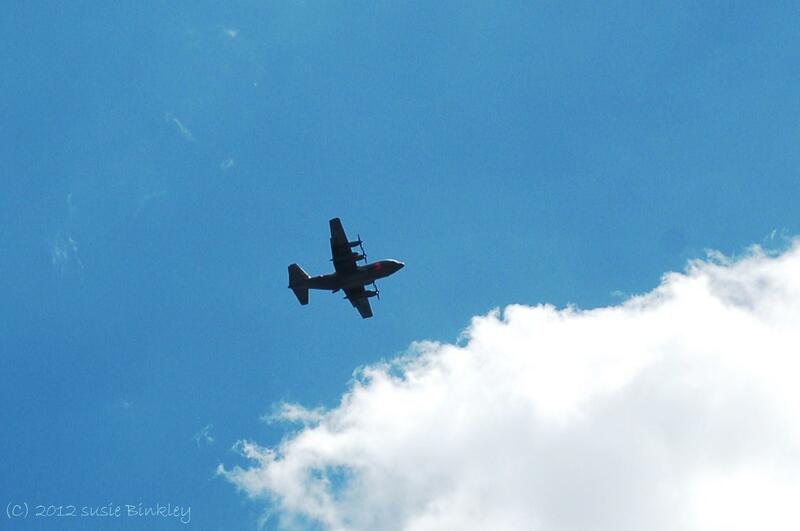 Back home, there was now an endless drone of airplanes and helicopters over our heads. I posted on Facebook that while it made me feel better that the C-130’s had joined the fight, it also made it scarier, it made the fire seem close to have them flying overhead all day. For some reason I was becoming more unsettled. I guess that pessimist’s vision was kicking in. 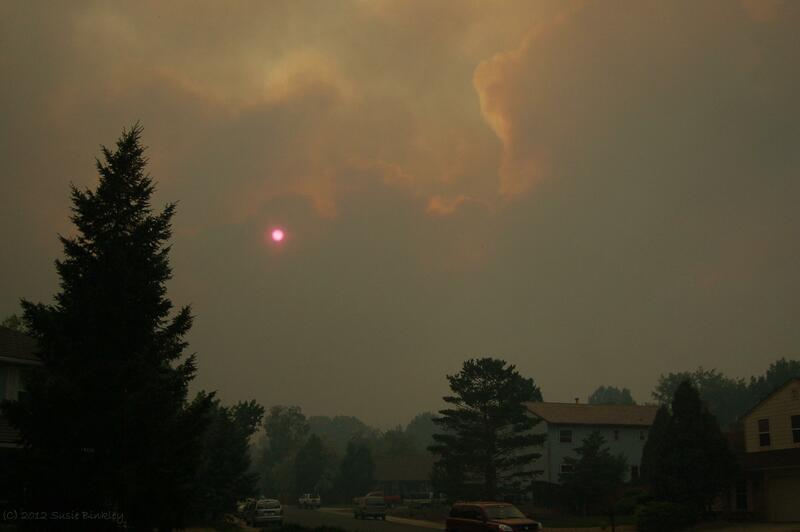 For as the afternoon wore on, and it got closer in time to go get my daughter, the smoke thickened and seemed to settle in towards the ground. I wandered into the street again, jaw open. What was going on? 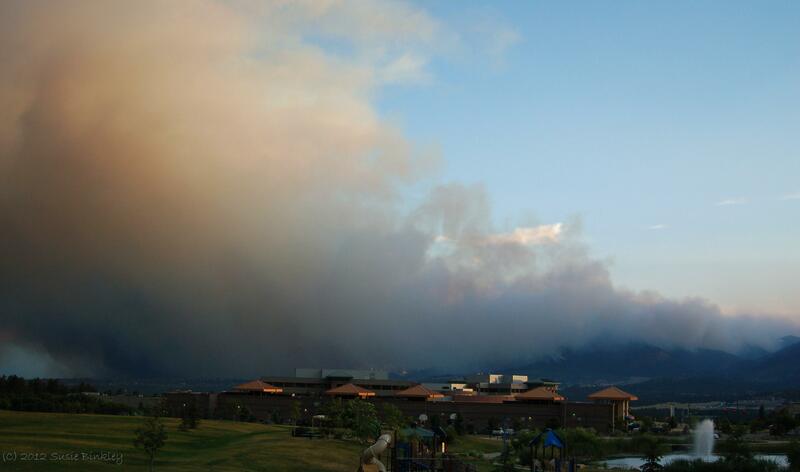 The Front Range was disappearing behind a wall of smoke. It should appear continuous, but a shroud was settling in. We arrived at Challenger, and the view back to the west, toward home, was becoming more ominous by the second. Remarkably, she kept her cool as she took these, but then as we exited the highway and headed west towards the smoke, towards home and all our belongings and our 8 beloved pets, she, and I, began to lose it. 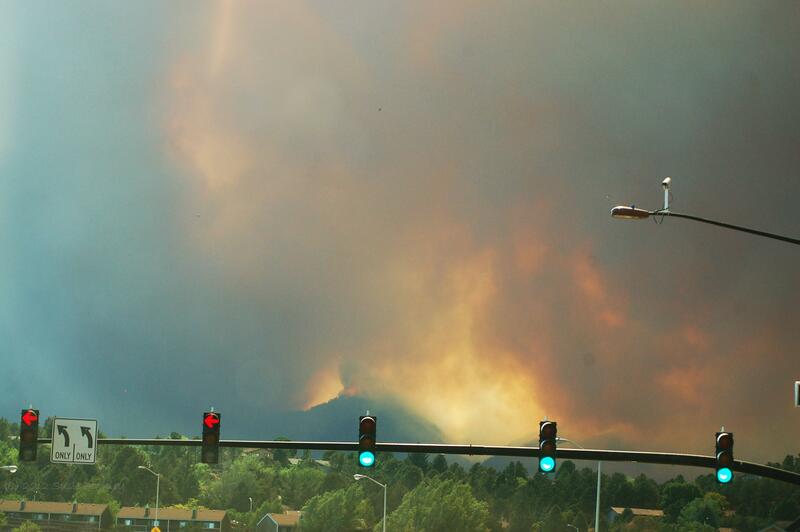 There, above the left-most green light, we saw flames overtaking the Front Range. And as we continued, the scene only got worse, became more frightening, and reality hit us. I fumbled on the seat next to me and handed something to her. “Call your father. We need to evacuate.” The tears began to flow, and flow, and flow. My husband works downtown, 15 minutes away. She handed me the phone as we rounded a curve in the road and saw more flames. He was an hour away. I’d have to do this without him, in one car. A minute later as we pulled up to the house and began frantically packing up. Where to begin? How to get my head on straight? Gotta keep the kids calm… My mind was racing as I tried madly to stay organized and be efficient. 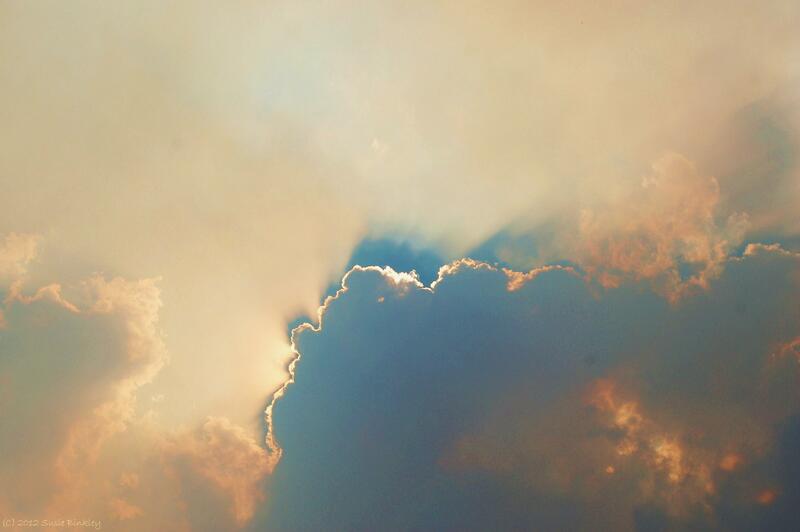 But the smoke was overwhelming. It was terrifying. The smell was absolutely horrific. 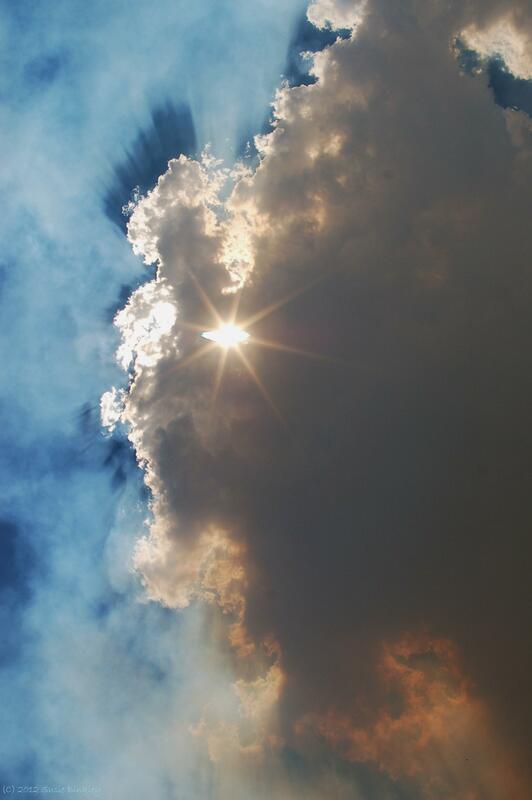 The 65 mile-an-hour wind that had pushed the inferno as a firestorm over the ridge and down into Mountain Shadows to our west was now slamming our house with this hot, stifling, choking mess of smoke and ash. Countless sirens wailed in the distance, more than I had ever heard in my life, as if the fire trucks themselves were hysterical. I tried to pack the car but couldn’t take it. I had to pull the car in the garage and get the door shut. Of course, now there were things in my way, I was choking and out of breath, and time seemed to stand still. 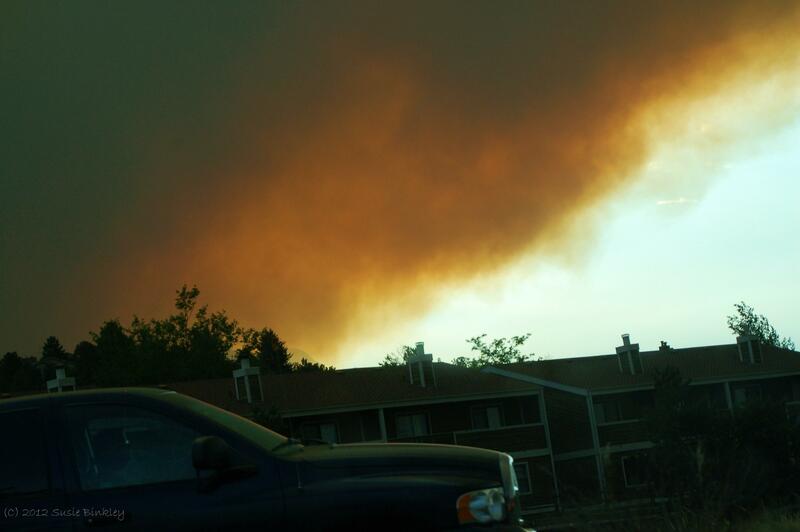 Worse yet, once I got the door shut, the house got hotter and the stagnant smoke hung like a blanket. The sight inside the house was eerie. A bizarre yellow haze settled in like an alien fog. Eventually it engulfed the neighborhood. We couldn’t see across the street, and every window, with the blinds open or closed, looked like we were standing inside a bright golden mustard-colored balloon. The smoke was choking. My asthma was kicking in and my eyes burned. I don’t know how many times I controlled myself from throwing up. My son was breaking down, crying. My daughter kept feeling faint. My brother called. He’d gotten home (they live around the corner from us). We had time to get out, he told me. 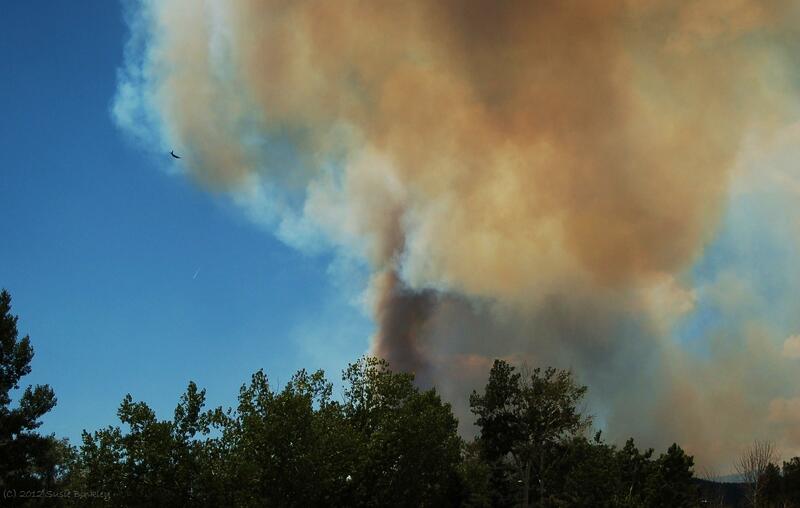 The firefighters were still holding Centennial Boulevard (the main defensible fire break). Ok. I believed him. Breathe. It’s incredible how long it takes to load all of your stuff when you’re only half-packed. Where did the dog leashes go? Don’t lose track of the medicines. I’m forgetting a box of pictures… We were frantic. But a neighbor’s friend had stopped by and said the roads are still clear, and they’re still holding Centennial. You still have time. So we kept packing stuff. And then, to my astonishment, my husband pulled up in the driveway. Over an hour had already gone by. 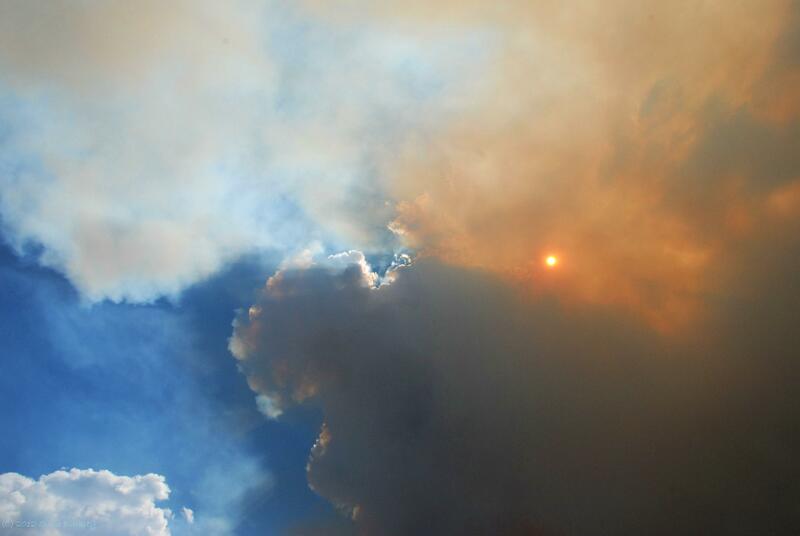 By now the ghastly yellow had lifted and the winds had shifted the smoke momentarily. It seemed that day was turning to night. The smoke was everywhere. I snapped this pic, then ran to load up his car, too. We stared at the house for a surreal moment before driving away. As we backed the cars out of the driveway, something large fell from the sky. It was two pages of an old magazine, burned all around the edges. It fluttered to the ground and stopped smoldering. My husband, compelled for a reason he still can’t explain, picked them up and took them with us as we drove away. We got to the the top of our street and the Colorado Springs Police were directing traffic- now all lanes outbound. My husband had been lucky to get back IN and get home. There are only a couple of main roads out of the rugged, hilly Northwest side. 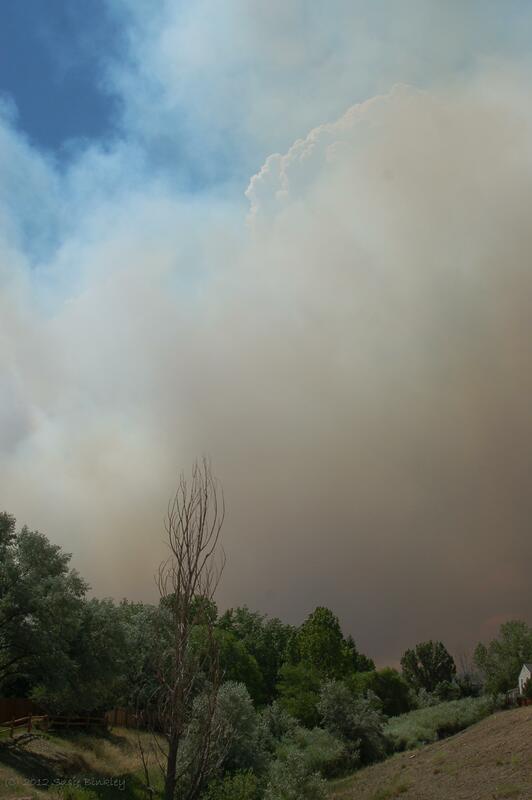 Centennial Boulevard was now the front line of the fire, so everyone, all 24,000 of us, had to get out the other two roads. Unreal. Heartfelt thanks, praise, and gratitude to the police officers in masks, directing traffic as calmly as they could, who got all of us out without any injuries. 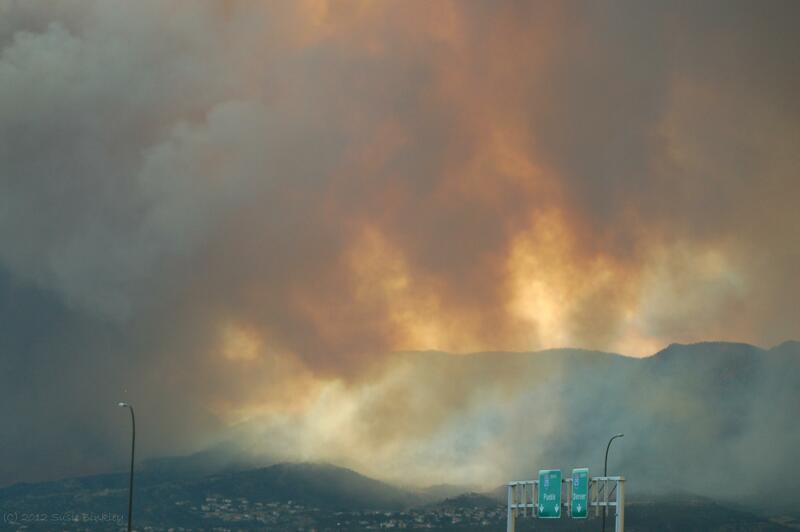 Heartfelt thanks, praise, and gratitude to the firefighters who fought for every home they could to our west in Mountain Shadows, and who fought to hold the fire back at Centennial. My daughter rode with my husband. My son was with me. Again I handed him the camera as thousands of us snaked our way out Woodmen Road. So many people were still on Woodmen Road, still waiting to get out. It looked like the eye of a monster that was attacking the mountains. 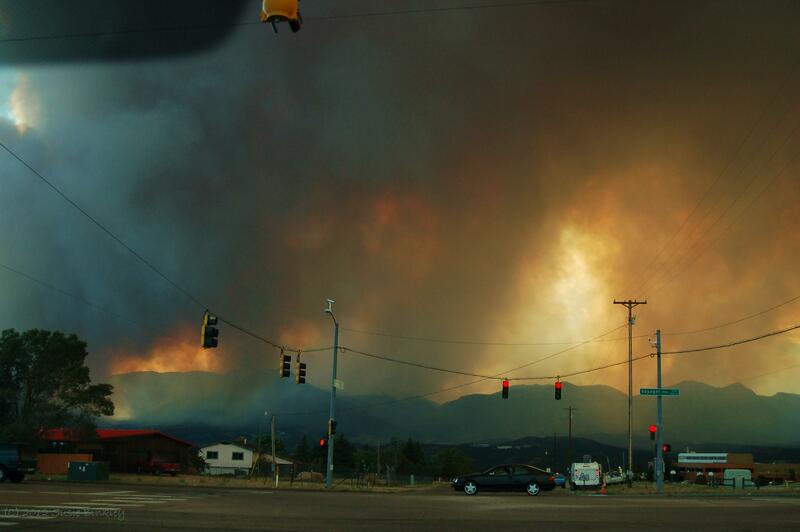 And as we drove north out of the heavy smoke plume, it felt like being transported away from a battle scene. Being out of the smoke was almost as surreal as being in it. Our emotions shifted, they almost slid, from frenetic panic and desperation to… utter numbness as we arrived in Northgate. We stopped in a parking lot and stared blankly down at the west side of the ‘Springs, as it lay before us, engulfed in smoke and flame. Then we made our way up to our kind & generous friends’ home, where our fellow evacuees were waiting for us, worrying for us. We were glad we were together, with people we love and trust, as we hugged and cried and realized our lives were being turned upside-down. The kids, reunited with their best friends, sat on the deck with us, helplessly watching a wide swath of their city burn, wondering if Centennial would hold, wondering if we’d all still have houses when then sun came up tomorrow. We were refugees, chased from our homes by the monster that was attacking over the mountains. I didn’t sleep more than an hour that night. My sister-in-law, Jill, said she never slept at all. She was pretty emotional for someone whose nickname is “The Ice Princess”. She keeps telling me, “That was the most terrifying experience of my whole life.” Me, too, Jill. Me, too. Over the next few days we rode an emotional roller coaster. 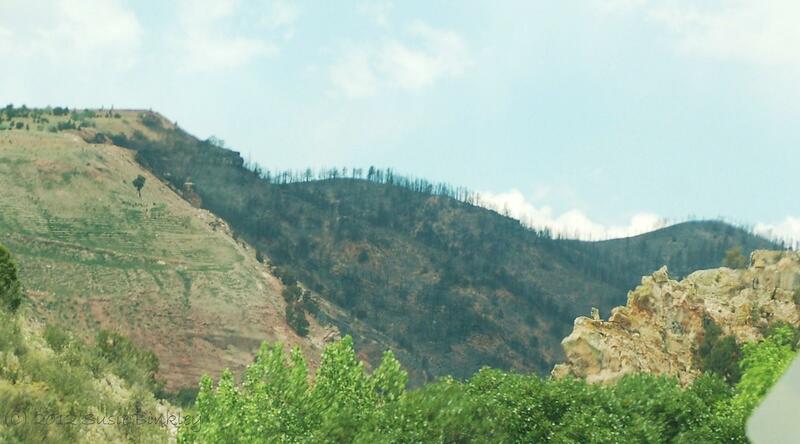 It became clear that Mountain Shadows had borne the brunt of the damage, but initially we didn’t know if the fire had breached Centennial. Eventually I saw an infrared map of the worst damaged area. It showed our friends’ house in the red: burned. I finally showed my dear friend, and we had a very somber evening that day, wondering if the red was damage or destruction. The map didn’t even show our house at all. But that night’s dismay turned to bright rays of hope the very next morning. Someone emailed us a detailed satellite image that I pulled up and zoomed in on. “That’s a roof!! !” my friend exclaimed. There it stood, their house. Though we had no idea the extent of the damage, we at least knew now that they had a home, still. And so did we. The fire had not crossed Centennial. Incredible, those first responders had been. Absolutely incredible that they contained that inferno and saved the rest of the northwest side of the city. We huddled together, evacuated and feeling lost. Grateful beyond words to the kind friends who had opened their home to all of us and given us shelter and comfort. We lived together for several days, in our dazed and confused state, as information trickled in and the extent of the destruction truly became apparent. Much of Mountain Shadows was leveled and gone. The number of houses destroyed stood at 346. Two people had died. My daughter had several friends lose their homes. 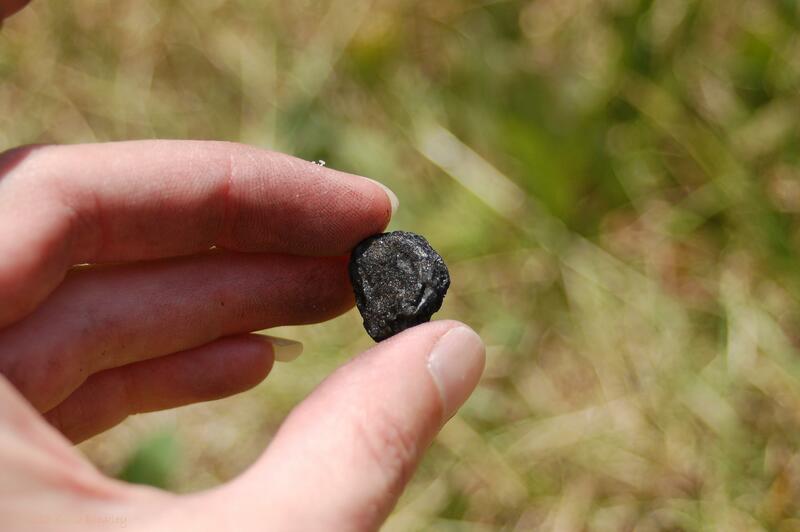 The once-gorgeous mountainsides above what remained were charred black. The house next door to our dear friends’ (our fellow evacuees) house had burned to the ground. Our friends had been so lucky, though it’s terribly hard to feel lucky when so many you know have lost so much. Many in this town now have ‘survivors’ guilt’, or ‘my-home-is-still-standing but yours isn’t’ guilt, or ‘I got un-evacuated and back to my home before you did’ guilt. 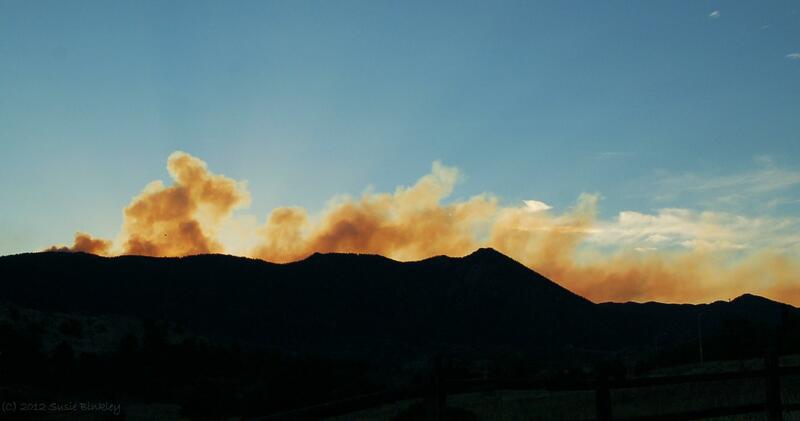 We got to go back to our home a few days later, though our son refused to stay in the house the first two nights because he could see Blodgett Peak- one of our favorite hiking spots- smoldering from his bedroom window. 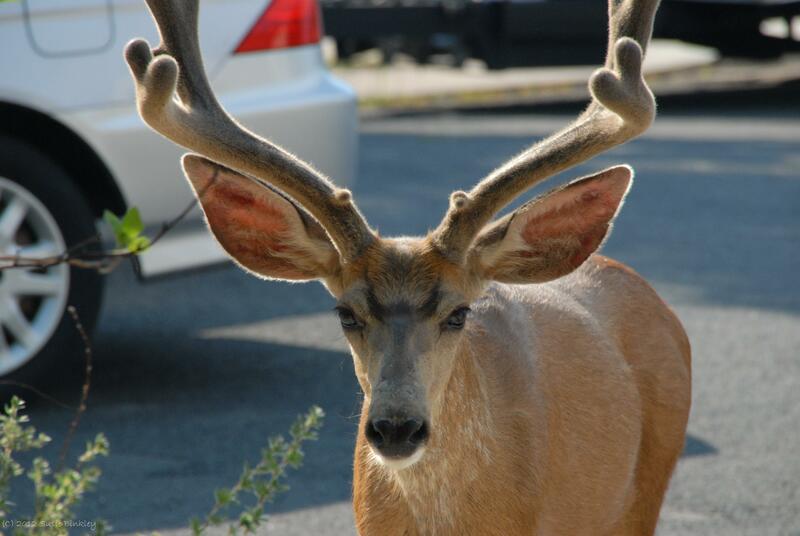 But when we did get home, on a sweltering 90-some-odd-degree day, we were greeted by some of that wildlife that we all love so much. It was hot and so dry out and very, very smoky. 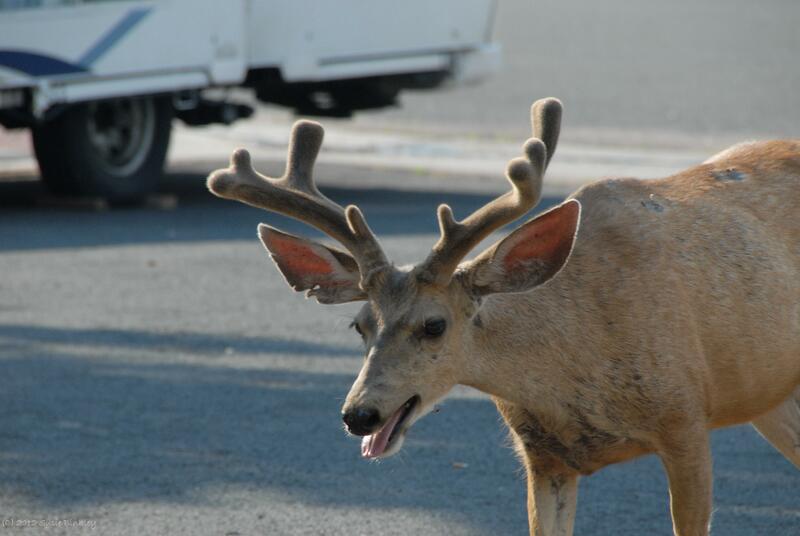 Our neighborhood herd of roaming mule deer bucks saw us come home and crossed the street, right up to our driveway as we snapped pictures. They were panting, dragging along, and looking miserable. 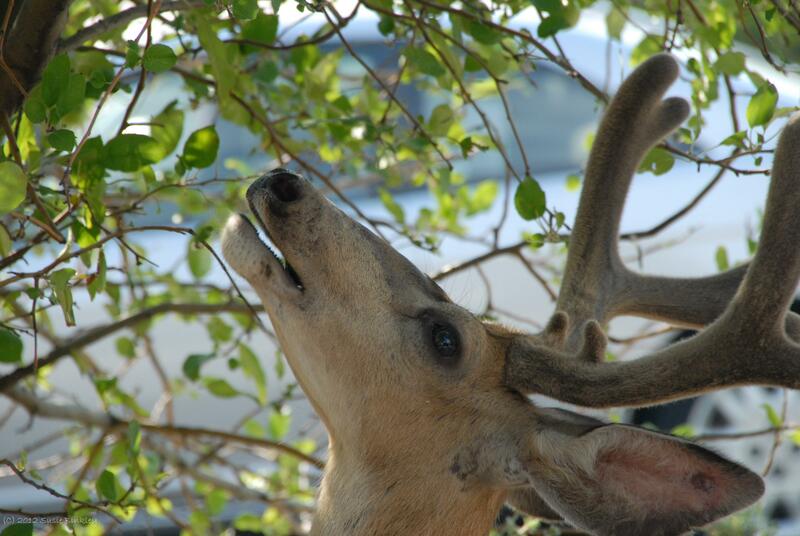 They took a few munches on our apple tree, my husband brought them a bowl of water, and they went to rest in the neighbor’s shade. Everything smelled somewhat like smoke. The house, the trees, the deck, everything had a stale, irritating smell that was even worse after you’d been gone for a while or just got out of the shower! But we had a house, and no major smoke damage, so why complain. We aired it out and aired it out, cleaned and re-cleaned the air filters, and got to the enormous task of cleaning up the gigantic mess we’d made when we evacuated. 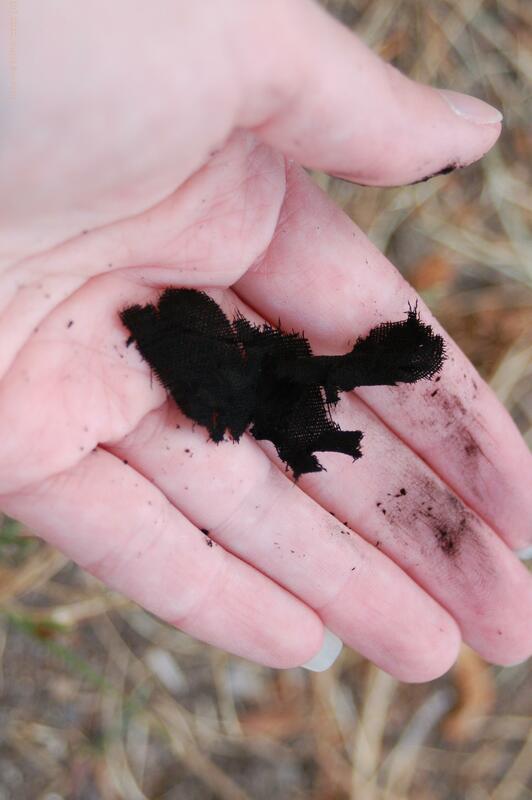 The kids and I found ourselves wandering our property, picking up pieces of fire debris: ash, cinders, bits of people’s clothing, mangled, melted pieces of unidentifiable burned material, and crumbly bits of black soot. They’re now in a box- the “what could have been but luckily wasn’t” box. It sits next to the magazine pages my husband picked up. He framed them. A week later we finally actually felt moved back home. We also felt more organized. We’re ready, now. All the pictures and important papers are together, we know what we’d pack if this ever happened again, and we’re hoping and praying it never does. The only thing that finally calmed us down was rain moving in. Then we stopped worrying about the fire, or more fires in the near future. Now we worry instead about flash flooding off the burn scar. Ah, monsoon season in the Rockies. May it be gentle on us this year. And we worry most about our friends, for they aren’t back home, still, two and a half weeks after the firestorm overtook the Rampart Ridge. They have significant smoke damage, some structural damage, and the weariness in their voices often brings me to tears, though I do my best to hide that and stay upbeat. Their home needs to be professionally cleaned before it’s even liveable. It will be weeks more before they go home. And it weighs on us all. 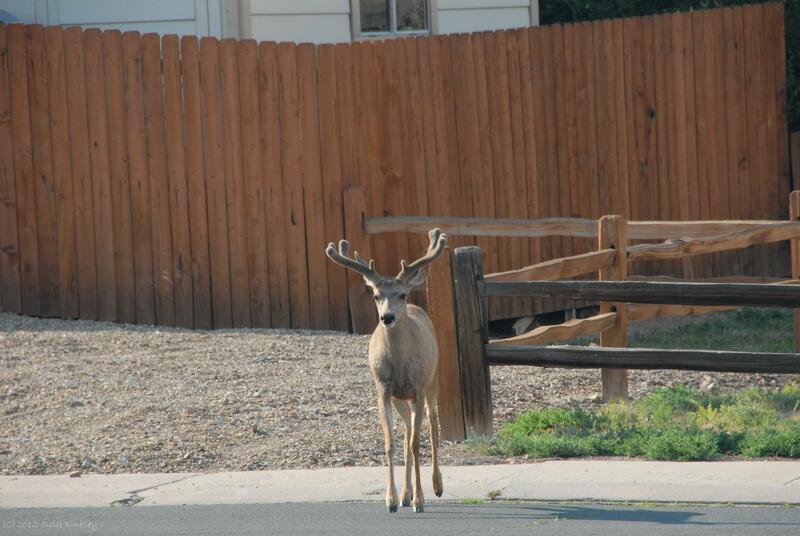 Everything that happened to our neighbors to the west in Mountain Shadows weighs on us all. For now, I guess, we just accept that weight… that weight that’s part of the New Normal. It’s (almost) funny, summer is usually my favorite season- all the hiking and camping and nature photography, the flowers and baby animals and fun. Hmf. I’ve never wanted it to snow more badly in all my life. This record-breaking, hot, drought-stricken summer can be done, now, thank you very much. Since June 23rd I’ve been waking up having nightmares. This morning I finally didn’t. Perhaps that one small step heralds the arrival of the New, New Normal. I hope so. Today I begin washing our dear friends’ clothing and bedding from their home. One small thing I can do to move them forward to a better New Normal. Although this new normal still brings some scary stuff with it. We had another bobcat behind our house again today, the second one in the past couple of weeks, no doubt another evacuee/refugee from the fire. New Normal for him, too, I guess. Time to keep our four dogs on a shorter leash. I’ve been through enough hardships in my life to know that the key is to keep moving forward, to keep your eye on the day, however close or far off it may be, that you feel good again, calm again, happy again. You just keep reaching for that day, never letting your attention waver. As this all began, Jill and I had been in the process of starting a new business. We were on the verge of filing our state paperwork to make it all official, we had researched everything we needed, and felt ready to launch by mid-summer. That’s why I hadn’t posted a new blog in a while. Our organic cookie company was about to be born! Well, I guess that was false labor. It might take a little bit longer now that we’ve lost some momentum, but now more than ever doing something creative, something that brings something new into the world, feels so healing. As our community rebuilds, we’ll build along with them. 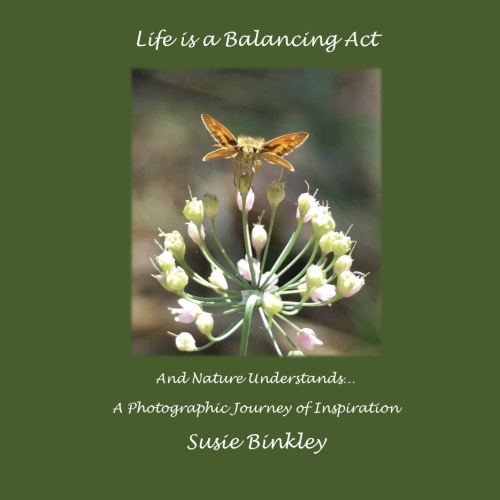 Just as my books and my blogging have been wholly focused on the healing power and beauty of nature, this business carries forth in the same nature-inspired and nature-honoring spirit. 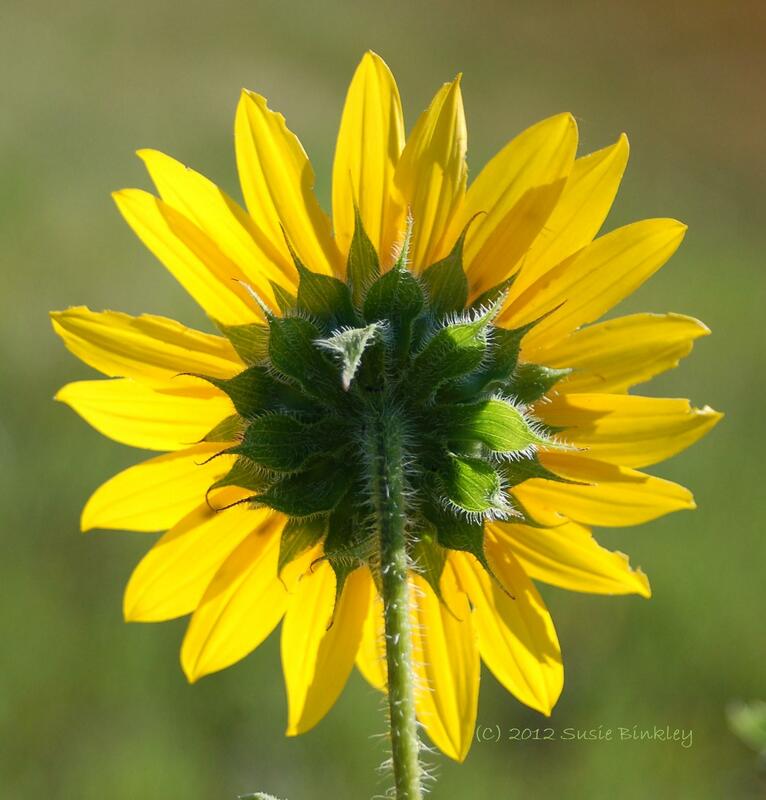 And goodness knows our nature around here could use a little inspiration to re-grow. I’ll keep blogging, be patient with me. My artistry has found an additional (and tasty) outlet, but my camera still beckons. 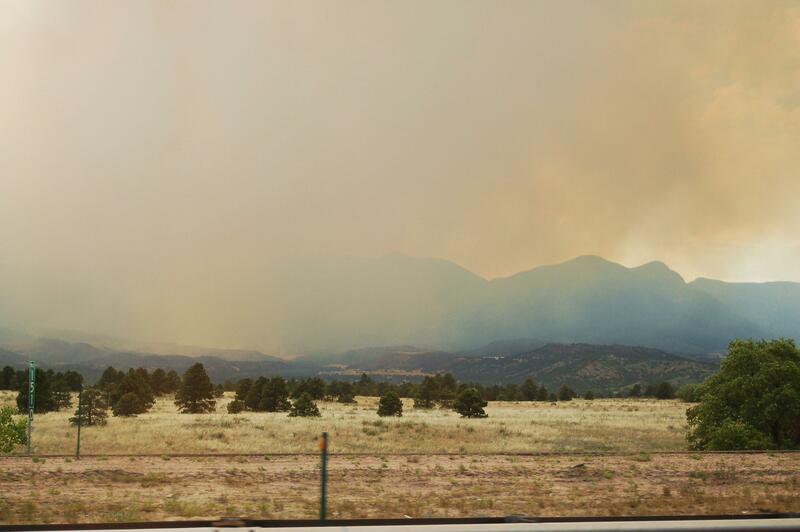 I am relieved that Garden of the Gods was spared in this tragedy, but I mourn the loss of a devastatingly wide swath of the Front Range, charred to the ground beyond recognition. I weep for the once-lovely natural land now suffering so terribly, surrounding and cradling the humans who love it so much, who are suffering miserably alongside it. I may have to accept the New Normal, but I don’t know that I’ll ever adjust to our new view. 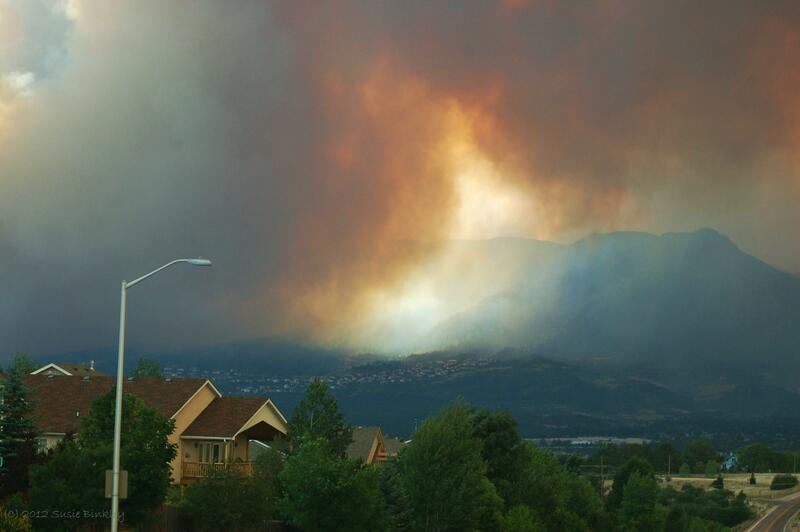 A sad, daily reminder of June 26, 2012, and the devastation of the Waldo Canyon Fire. A once thriving forest, reduced to standing charcoal toothpicks. At least those brave men and women saved as many homes as they could, as well as Garden of the Gods and our other beautiful attractions. That is so much to be thankful for. Our community has pulled together and will rebuild, replant, and renew our love for this wondrous place.